Jo and Dawn work together to assess problems and then help riders correct them. Personalized Biomechanics Assessment gives horsepeople the opportunity to have what is essentially a private Biomechanics Clinic session with Jo Belasco and Dr. Dawn Adams. People who have already taken a Horse Biomechanics Seminar will have acquired terminology and basic knowledge that makes the Assessment particularly effective. Those who have not yet taken a Horse Biomechanics Seminar are also eligible to sign up for an Assessment, though taking a seminar prior to an assessment will let the rider understand more about why we make the recommendations we make, and how they as riders can carry forward with our suggestions on their own in the future. 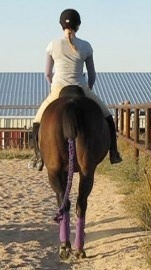 The assessment works much like the one-hour riding portion of the Horse Biomechanics Clinic. You describe any particular concerns or problems you’re having to Jo and Dawn, and then carry out riding exercises we assign that help us discover areas in which you and your horse may be biomechanically out of balance or interfering with your own or one another’s movements. After Jo and Dawn work with you to assess what’s happening and why, Jo works with you on changes that improve your and your horse’s individual and collective balance, movement, way of going, and willingness. The session lasts one hour and focuses on the issues that appear to be most critical, so it is important that you have your horse tacked up and ready to go when we arrive or that you arrive on time if you trailer to our facility. A limited number of sessions is available each week, and they are reserved on a first-come, first-served basis determined by the date and time that deposits are received. Cost for a personalized Biomechanics Assessment is $100. A $50 deposit is required to reserve an assessment appointment. You may choose to make the deposit before setting a date and time so you’re “in line” as early as possible, or you may choose to make the deposit after corresponding with Dawn or Jo to find a time and date that works for you. If you make a deposit to initiate the process but we can’t agree on a date and time for your session, your deposit will be returned. To schedule a personalized Biomechanics Assessment, or to ask questions and get more information, please fill out and submit our Contact Form. We respond within 24 hours. You may make your reservation deposit through Paypal, using the button below, or you may pay via cash, money order, or personal check (in which case please submit a request for mailing directions using our Contact Form). You may also use the button below to pre-pay your session in full if you want to. The balance of your session payment, $50, is due no later than 7 days before your scheduled appointment. Failure to pay the balance by this date will result in cancellation of your appointment without refund of your deposit. For additional details on our refund policy, please see the section on Biomechanics Assessment here. Payment of either a full fee or deposit does not guarantee your reservation unless and until you have confirmation in writing (via email) from Jo and/or Dawn. Help us get a book on horse biomechanics published for the entire horse community!